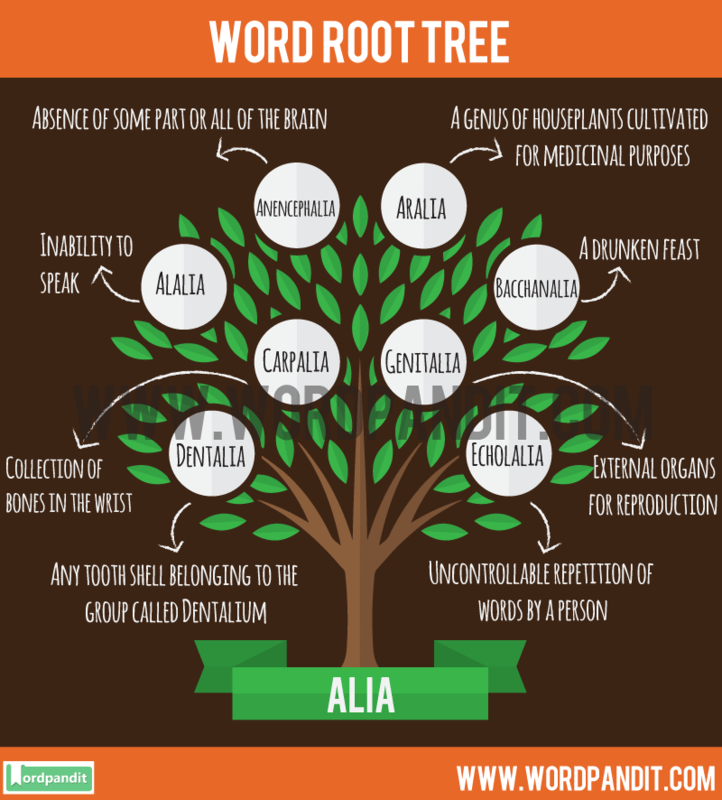 What does Alia) Root Word mean? It is fair to say that words with the word root –alia is mostly used to refer to belongings. She collected all her Paraphernalia before she left the house. 1. Alalia : Inability to speak, pronounce common words or language. 2. Anencephalia : Absence of some part or all of the brain in a living being. 3. Aralia : A genus of houseplants cultivated for medicinal purposes. 4. Bacchanalia : A drunken feast in honour of Bacchus. 5. Carpalia : Collection of bones in the wrist. 6. Dentalia : Any tooth shell belonging to the group called Dentalium. 7. Echolalia : Uncontrollable repetition of words by a person. 8. Genitalia : External organs for reproduction. 9. Marginalia : Marginal notes. 11. Orientalia : Books , manuscripts and other documents related to Oriental culture and history. 12. Palilalia : A disorder in which words are rapidly repeated. 13. Paraphernalia : Personal articles reserved by law for married woman. Also, equipment necessary for particular form of activity. 14. Radialia: A bone or cartilage in fish’s fin. 15. Regalia : Emblems , symbols or documents that indicate royal lineage. 16. Tartanalia : A woollen cloth with stripes of different colours, worn mainly by the Scottish clans. 17. Qualia : A distinctive quality, for example Bitterness, which is completely independent.